Tom and Bill: Heroes Don’t Always Wear Capes | NFL News, as it happens, when it happens. Your one stop shop. I’m not one to get into post-game fashion banter, but let’s start with Bill wearing the power suit. (Most likely from Men’s Warehouse unless Linda sent him down to Newbury for a custom fitting. My money is on the former.) We’re most likely to see the Bill whom uses the three finger hair brush. The one whom still has the red challenge flag hanging out of his tube sock. And the one whom does a mediocre job on cutting the hoodie sleeves with a pair of Fiskars taken from Ernie Adams toy box. Bill brought the suit and tie ‘A’ game in East Rutherford on Sunday, but it didn’t stop there. Again, BB used his Jedi mind tricks on the Giants, Tom Coughlin, and Elijah to completely mismanage the clock in a key moment in the game. 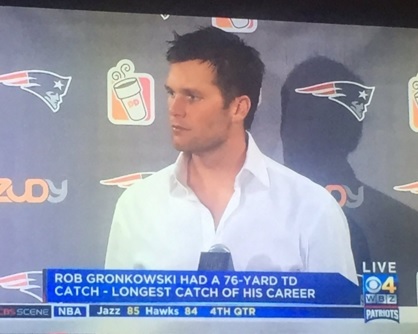 This enabled TB12 to do what TB12 has done for the last thirty-eight years of his monumental existence. Would I be surprised to hear that Bill practiced the lateral drill in the special team’s portion of practice after the Miami/Duke debacle a few weeks back? Of course not. He out prepares you. He out thinks you. Somehow, Belichick uses some hallucinogen on every other head coach in the league when it gets down to crunch time. And the effects aren’t short lived. Take a gander into the standings of the last three teams the Patriots emasculated in the playoffs. The Ravens are at the bottom of the barrel in the AFC. The Colts have a quarterback whom is most likely gone until Christmas. Not to mention, I teach boot camp classes at Latitude in Bradford and Methuen to a group of women who could handle the Colts. And, the Seahawks already have more losses this season than the Patriots have in the last three. God is good. 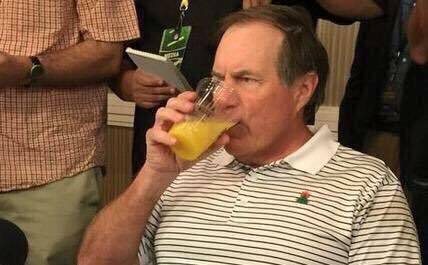 “Bill, why on earth did you take the wind in the Denver game, and play straight goalline against Seattle in the Super Bowl? Speaking of his Holiness, now we turn to our hero. Usually you see some killer suit, tie, and pocket square combo that just makes your head spin. Not even close on Sunday. Not even by a little bit. Tommy completely flipped the postgame presser game on its head coming out in a solid white button down. Did he leave two buttons undone on purpose? Most likely. Such a power move coming from him too. He comes into Giants stadium, against a team whom has given him trouble in recent years, and decides NO DRESS CODE. 4X Super Bowl champions can do things like that, especially ones that are married to Victoria Secret models. Maybe the buttons being undone were a tribute to Jules. It is no secret JE11 and him are tight. Edelman secretly wants to be TB12, and that is OK. Any normal living New England born male is kidding themselves if they don’t feel the same way. Would you take five years off your life to be Tommy for one day? I’d take ten. If it is the difference between of living 92 or 82 years. Sign me up. No questions asked. Sometimes these games feel like they take years off your life. The fact this was a late afternoon game had me so jacked up, sleeping was going to be questionable move. Could you imagine if this were a Sunday night game? Forget it, I’d be awake until Wednesday watching Charlie Moore Outdoors. As much as I want to strip the manhood from every team we face, I want them battle tested for when the games get tighter. You need games like this, on the road, where difficult situations are thrown in front of you constantly. Your best receiver goes down? No worries, Bill cloned another one in Amendola. The linebackers are having a tough time in coverage on the swing pass and drag routes? Oh, just bring Patrick Chung up closer to the line whom you basically stole back from the Eagles to keep them honest. The whole plan and modus operandi of this team is genius. They take what you do best away from you, and then make you rethink what you think you are good at. Essentially a combination of all of this led to putting Coughlin in a coffin (credit to Lauren Cataldo). He is dead, there is no coming back from this. Thoughts and prayers out to the Coughlin family. The absolute gem and final takeaway of this game is the Commissioner was in attendance. Yes, that lying scumbag was there to witness Bill and Brady rip the hearts of out 70,000 people in their own house. Roger may just be a good luck charm for Brady. He ripped the pants off the Colts in the AFC Championship game. He then proceeded to win his fourth Super Bowl title and third MVP. And most recently threw the Giants in a locker after he took their lunch money late in the fourth quarter. Thanks Goodell. You made us do all of this. Remember that. To top it all off, Brady turned down Michelle Wolfson for the millionth time this year then plays the ‘No Dress Code’ card in the presser. Bill gives a wave to someone up in the stands (we still don’t know who it is to this day, my money is on Ernie Adams) and does a reverse Clark Kent and goes into the power suit for the postgame. The Patriots are 9-0, but that doesn’t get you anything in this league. Unless you’re the Colts, that gets you a 9-7 banner. One more side note, if you feel the need to get jacked up and run through a wall pregame next week against the Bills when ESPN is in town, give this a listen from my barber. Completely kills it and rips the NFL’s face off.